Yesterday I went to San Lazaro Hospital at Quiricada, Sta. Cruz Manila to visit my teenage cousin who was confined there because of dengue. We bring my teenage cousin there last Sunday night after we knew the laboratory results for her CBC with APC which drops largely below the normal range. We also decided to bring her at that hospital because of some suggestions of their good service. San Lazaro Hospital is a government hospital with clinical services for Infectious/ Communicable Diseases like Meninggitis, Dengue Hemorrhagic Fever, Measles, Pneumonia, etc. When we arrived there last Sunday and my cousin was admitted, I have noticed that they observed order and cleanliness. Although most of the people working there are so strict from the security guard up to the doctors and some are even snobbish, the hospital is a nice place because it is clean, in good order and I think that the patient will be handled in good care. My cousin was confined at the third floor and I tried to take some photos while I walk in their hallway. 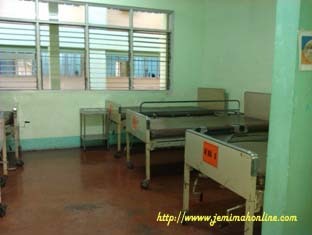 The place is not so big but there are only few patients and few people there. I used their elevator to reach the third floor. It was scary to use the elevator because the elevator sounds so creepy and I was the only one who ride. I also saw some rust at the side and I am just thinking that the elevator might need some maintenance because of the creepy sounds when it opens and closes although it is not that too old. I finally reached the ward room of my cousin and I must say that its not bad. Her bed number is so easy to distinguish and the room has enough space. The ward room is clean. Although there is no electric fan inside the room and television sets, you may feel comfortable because it is not noisy and polluted. The room has big windows allowing natural air to pass through and you can also see some trees outside the window. According to my cousin, you can also bring your own electric fan if you want. Since it is a government hospital for public service I believe that they have a good service with its order and cleanliness. 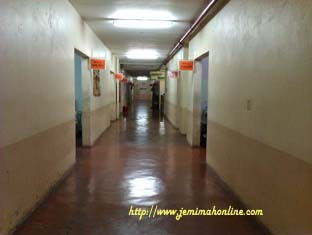 The visiting hours at San Lazaro hospital is from 4:00 PM up to 7:00Pm only and they are really strict so visitors should follow. Before I go home at around 6:00 Pm we felt the earthquake shakes that moves some of the things inside the room like the beds and chairs. My cousin who is a patient there almost wanted to rise from the bed and I can see her nervous face and also her mom. I keep the situation calm as I tell them some beautiful stories and in my mind I pray to God. I hope and pray that my cousin will be better and recover immediately. Today, I made her Camote Tops juice for her fast recovery that could be an alternative cures for this kind of illness. I tried to research on how to help a dengue patient to treat a low platelet count and I just believe that the Camote Tops Juice that I make with orange and Calamansi will improved her health condition. 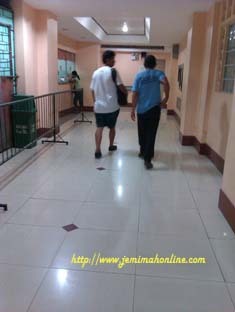 This entry was posted in Places and tagged Government Hospital, San Lazaro Hospital. Bookmark the permalink. My 16yrs old sister is now being confine at San Lazaro Hospital. The doctor confirms she has Dengue Fever after sufferring from high fever, her body temperature goes up to 40degrees for 2 to 3 days, Severe headache, muscle and joint pains. I get so worried for my sister coz for all we know Dengue is considered one of the killer desease from all over the world. I am currently searching for an information that will help my sister for a fast recovery, and lucky me coz i have reach the story of you and your cousin who also suffers from dengue. Thankyou for your story it helps me a lot. I hope many people will be able to read your story for as you gives hopes to those who suffers from Dengue Fever. Your’e absolutely right that the best treatment to any kinds of ill is deep faith and prayers. :):) Thank you!! :) God Bless you and your whole family. I hope your sister will have a fast recovery. Just keep your faith and my suggestions with camote tops juice will really help a lot. God Bless! the hospital is really a winner when it comes to cleanliness and orderliness. however, most staff are ill-mannered. they treat the patients like animals. they yell, they shout, they act like gods. they actually have a large poster of patients’ legal rights at the main lobby but i think they should remove it. they’re not following it, anyways. sterndal, my dear. If those patients were treated like animals then no one will go there for treatment again? How will you let me believe with such kind of arrogancy in you. They might shout but not yell for everyone to hear. They might yell maybe because it depends on how ill mannered you approached them too. Those people working in any other hospitals are also human. It depends on how you approach them but if you pay them no respect then perchaps you dont have the right to be respected too. I respect all your comments. Our opinion really depends on how we view and experience a certain place, events or things that made an impact on us. In my posts, I usually share what is positive and good that may help my readers. Although there are some bad things that we’ve experience, I believe that it maybe a way on how we can adjust to the situation or correct it. etrndal.. it depends how you approach the staff.. maybe they response on how you approach them. my son is currently confined in SLH and we find it so disgusting specially the C.R .. and to think that not all the rooms has its own comfort room. And its just so scary specially the part infront of the elevator at the opd bldg. its like a garbage storage and its so dark.. its abandoned and they havent even thought of covering it so that its not barely displayed anyone who gets to the elevator have to pass there and the smell just stings.